Zombies We've Known and Loved. Many of today's popular horror movies can be traced straight to the breakthrough success of 1968's Night of the Living Dead, an attempt by regional Pittsburghers to 'make a really scary film.' They succeeded all right, in that their eerie B&W zombie siege picture haunted midnight shows for at least twenty years. The average micro-budgeted independent horror of the 1960's was like a picture puzzle with a chunk of pieces missing. Acting skills were more often than not inessential, but a show with a good story and exciting direction was a rarity. Night of the Living Dead's sometimes weak performances are completely outdistanced by its storytelling skill. I was present at a 1970 midnight screening attended by supposedly jaded Westwood film fans. We had responded to crude photocopied handouts distributed around UCLA: Midnight Horror Show, Plaza Theater, One Dollar. One could feel the dread in the audience. Working with little but his own imagination, ex- industrial film director George Romero trapped us in a house under attack by an army of ghouls, without a chance of escape. It's one of the few instances when I've felt the grip of fear seizing an entire audience. A crazed madman attacks Barbra and her brother (Judith O'Dea & Russell Streiner) are attacked in a rural cemetery. Barbra alone escapes and takes refuge in a farmhouse. Barbra's joined by Ben (Duane Jones), who realizes that she's in psychic shock when she cannot speak. Ben barricades the house as more shuffling killers arrive; the radio and TV report that 'the recently dead are reanimating and eating the flesh of the living.' The cellar door opens, revealing several equally frightened refugees hiding below. Argumentative Harry Cooper (Karl Hardman) clashes with Ben on the issue of leadership and strategy: Cooper wants to hole up in the cellar and Ben wants to fight it out upstairs. Harry's wife Helen (Marilyn Eastman) is concerned about their daughter Karen (Kyra Schon), who's been bitten by a ghoul and is in a bad way. Young Tom and Judy (Keith Wayne & Judith Ridley) decide to make a dash for the truck in the farmyard. Unfortunately, the group disunity is as bad as the zombie threat outside. Night of the Living Dead is the creative expression of a group of industrial filmmakers desperate to make a movie. For a film made by relative amateurs the settings, makeup and effects are excellent. The lighting is professional and the zombies are felled by bullet hits as good or better than those seen in Hollywood movies. The experience must have been something akin to a neighborhood Halloween haunted house project, the kind that gets out of hand because it's too scary for kids. The story takes itself entirely seriously. The screenplay cleverly limits our perspective to what the human defenders see and hear. Nervous radio and TV news reports make the crisis seem immediate and authentic. The media's sketchy facts remind us of the anxiety factor of real disasters, when one is desperate for useful information. The film transfers all of this tension directly to the viewer. I remember the midnight audience in 1970 looking for any excuse to laugh -- at weak performances, klunker dialogue -- so as to relieve the tension. But that defense falls away when the movie follows through on its gruesome premise. The hungry ghouls break through by the dozens. The survivors' courage and optimism largely come to nothing as the zombie horde mobs the house. John Russo's script stays on task and never allows the tension to subside, which is saying a lot for a homegrown production. But George Romero's directing sensibility carries the day. His handheld, unstable camera draws attention to itself only infrequently, as in a cut to a low angle of Barbra running that tells us she's going to fall right in front of the camera. Romero's montages of ghouls on the march are genuinely disturbing. Brief close-ups give us glimpses of post-mortuary wounds; longer shots show groups of shambling figures slowly converging on the house and its tasty human contents. Romero hits upon a truly brilliant idea for the 'ghoul feast' scene in the farmhouse yard. The sequence is processed n different stock to obtain a grainy, high contrast texture. It may have been done to obscure images of entrails, etc, but the effect is chilling. That scene uses a low, rumbling electronic tone that hits us almost on a subconscious level, and contrasts with the cleverly edited stock music cues that make up most of the rest of the film's score. Several scenes use abstracted sound effects with excellent results. The repeated stabbing of Helen is accompanied by strange stylized shrieks. It sounds as if the garden trowel weapon is laughing at her. As soon as Night of the Living Dead became a mini-phenomenon, the analytic autopsy began. Most of the theories see it as an allegory for an America under outside threat, but weakened by forces from within. The film has also been examined as a critique of race issues in America, with Duane Jones' no-nonsense black survivor doing battle for farmhouse dominance with the Alpha Male Harry Cooper. Is Cooper's plan to barricade in the cellar a wise one, or is he running away from a fight? Does Ben refuse to share his leadership role because he's right, or because he's resentful and stubborn? What's the significance of little sick Karen Cooper, a potential zombie infiltrator taking a horrible advantage of mother love? We can imagine Charles Manson seeing that scene, and then formulating his chilling prediction that America's children will come after their parents with knives. If not for a couple of odd developments, Night of the Living Dead might have remained a tasty obscurity. Young film reviewer Roger Ebert caught a Chicago matinee and observed unaccompanied small children crying in traumatized panic. Realizing that their parents used the theater as a cheap babysitter, Ebert wrote an article about the experience that ended up reprinted in the conservative Reader's Digest and thus read by half the homes in the nation. A murmur of notoriety accrued around the obscure title. If You Film It, They Will Steal it From You. The film was in a minor release from Walter Reade when someone noticed that the copyright notice had been left off the movie. Like sharks smelling 'Public Domain' in the water, the film pirates wasted no time. Cheap dupe prints were smuggled out of the labs and Romero's picture was soon showing everywhere, particularly in midnight shows around college campuses. The effect was double-edged. On the one hand, the movie saturated the public consciousness, becoming one of the first Cult Midnight Movies and an instant classic. George Romero became a potential hot director, and was able to begin an interesting film career. But the filmmakers were tearing their hair out because they saw none of the millions Night of the Living Dead was reaping at the box office. Some of George's partners and investors were understandably furious. Night of the Living Dead isn't going to die; its graphic horrors are just as effective now as when it made midnight audiences scream in unison back in my college days. A great many horror films have followed in its bloody footsteps, but none has captured its simple power to chill us to the bone. Genius Products / Dimension Extreme / Weinstein present Night of the Living Dead in a sturdy 40th Anniversary special edition. The transfer allows us to appreciate what is actually a very carefully filmed show, and the 5.1 mix is certainly effective. Thanks to its quasi- Public Domain status, the movie has suffered innumerable VHS, laser and DVD incarnations, some better than others. The version to get before this one was an extra-packed Elite Laserdisc. The disc's twin commentaries with Romero and the other NOTLD veterans are said to have been ported from that earlier Laser release, as is an audio interview with the late Duane Jones. The engaging new feature-length making-of docu One for the Fire contains new input from the filmmakers, including a couple of cast members and production partners not heard from before, at least not under amicable conditions. Judith O'Dea and Russell Streiner return to the graveyard location to reminisce about their little slice of cinematic immortality, and we likewise hear from Karl Hardman, Marilyn Eastman, John Russo, Bill "Chilly Billy" Cardille and S. William Hinzman. Kyra Schon now loves to tell her school pupils that she was the vicious child zombie from one of the scariest movies ever made. Pittsburgh in 1966 must have been a hotbed of avid monster fans, to come up with this new direction in screen horror. A ragged theatrical trailer, a still gallery and the entire original script on DVD-Rom finish out the disc contents. Potential buyers can rest assured that this 40th Anniversary release does NOT contain the version with the unwelcome 'added' scenes. 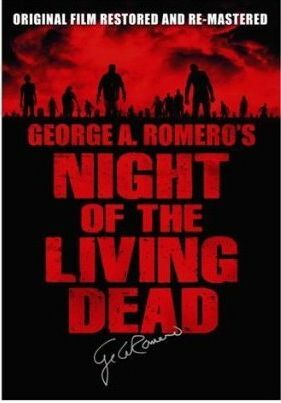 Night of the Living Dead is being promoted in tandem with the new Romero-directed zombie opus, Diary of the Dead.